Turn chops on side, and using a sharp knife, cut a pocket in each chop. Combine sage, salt and pepper, and pat it into chops. Set aside. Heat 2 Tablespoons oil in a large, ovenproof skillet. Add onion and celery and cook over medium-high until lightly browned, 4 to 5 minutes. Stir in cornbread, apples and cranberries and 2 Tablespoons chicken stock. Divide stuffing between chops. If there is extra stuffing, wrap it in foil and bake to be served with the pork chops. Wipe the pan clean. Heat remaining oil in skillet over medium-high heat. When hot, add stuffed pork chops and cook several minutes until caramelized and golden brown on both sides. 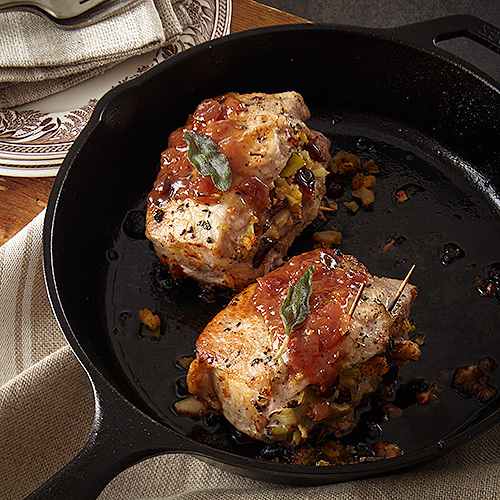 Finish pork chops by baking, placing the skillet in the oven and bake 30-40 minutes until cooked through. Meanwhile, reduce remaining 1 cup stock to 1/2 cup. When chops are done, remove from oven and place on warm plate. Pour bourbon into skillet and reduce by half. Stir in stock and Apple Cranberry Chutney. Bring to a boil and stir to heat through. Spoon over chops and serve.